EL CAPITÁN is a fictitious account of one man’s rise to power from the impoverished streets of Brazil to the head of Bolivia’s largest drug cartel. The story is a fascinating look into Bolivia’s violent and mysterious underworld. Involving the intertwining of lives through a complex twist of fate, the reader is transported on an unforgettable journey. Juan Carlos Begato is a small-time drug pusher looking to make a name for himself when mafia-head, Julio Álvarez, takes him under his wing. Colonel Esteban Santiago, chief of the local branch of La Paz’s anti-narcotics division, struggles to combat the cartel and thwart the city’s systemic flow of narcotics. He feels helpless in his quest to mitigate the escalating violence plaguing his streets. Ronald ‘Bigs’ Shea, a 'Cowboy Jockey' for the Guarachi Cartel, finds his allegiance torn between two rival conglomerates. Forty-seven hundred miles away, two Los Angeles detectives race against the clock to uncover a serial bomber before he strikes again. 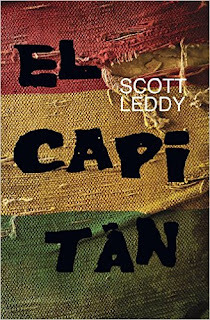 A combustible mosaic of interconnecting characters, EL CAPITÁN is a high-stakes thrill-ride about violence, greed and redemption. Filled with intrigue and suspense, the story is a MUST READ for adventure enthusiasts and adrenaline junkies. Scott Leddy is the successful sole-proprietor of a print brokerage firm and a graduate of Mercy College. Besides writing, he enjoys painting and music. A long-time native of New York, Scott currently resides in Connecticut. He has a wife and one child.